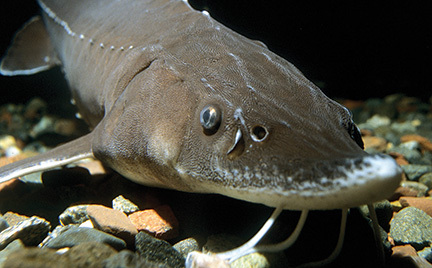 The oldest and largest species in the Great Lakes, the lake sturgeon can live for decades and weigh hundreds of pounds. It has coarse skin rather than the scales other fish have. In the spring or early summer, sturgeon swim upstream to spawn and females lay tens of thousands of eggs. The eggs are fertilized by males and then attach to rocky surfaces, hatching in 5–8 days.